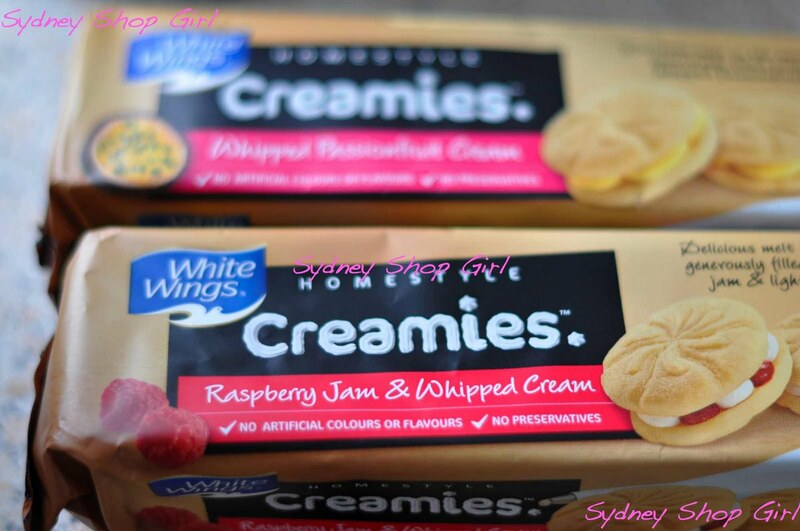 Sydney Shop Girl: White Wings' Homestyle Creamies Are Australia's New Tim Tam. 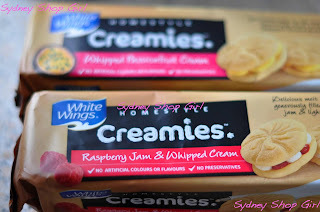 White Wings' Homestyle Creamies Are Australia's New Tim Tam. There are two things I love after my Sunday swim. A long hot shower and my post swim snack with a strong cup of tea. Today's snack was inspired by Miss Kitty-Cat's recent post in praise of White Wings' Homestyle Creamies. The almost empty shelves at Woolies and Coles speak for themselves, the people love Homestyle Creamies. I was among the fortunate few who got my hands on a couple of packets at Woolies yesterday. The Raspberry Jam and Whipped Cream as well as the Whipped Passionfruit Cream varieties. I've linked to the official product information page if you need to know a bit more about the range. I'm sure cream and jam filled short bread biscuits and a hot cup of team are what the Australian swimming team have after their Sunday training sessions at the AIS. If not, they should be. These are seriously good biscuits for a supermarket brand. The shortbread biscuits are buttery and have a good crumb. The raspberry jam taste like raspberry jam and the whipped cream isn't just sugary white icing stuff. They are the kind of biscuit that will be part of my post swim refuel for a very long time. Australia, meet your Tim Tam equivalent if you're not big on chocolate biccies for your afternoon tea / crisis carb. Homestyle Creamies look like they'd be easier to post than Tim Tams in a care package to expat family and friends as well. To go with the Arnotts' Barbecue Shapes and Allens' or Natural Confectionary Company Snakes. Have you tried the White Wings range yet? Do you have a favourite variety? I look forward to trying them soon. I will eventually get around to breaking open my packet of passionfruit Creamies - I'm just trying to be a 'smart' snacker now. Which of course, is not that much fun! They do look good...I have never been a tim tam fan I am afraid. I prefer plainer biscuits like Yoyos and Scotch Fingers;) And Bus biscuits with butter. I'm glad I managed to convert you. I'm a one woman mission on this subject! 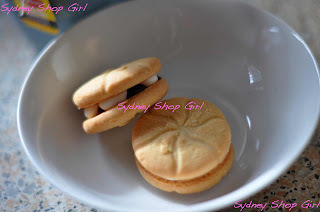 Just FYI, I have just returned from Coles and the biscuits are on sale!!!! Yum I so want some! Yuuuuum! These ones, these are my favs. Wow, who'd have thought? I never really buy supermarket cookies much but I'm tempted now!